This program is accredited by the Accrediting Commission of the American Culinary Federation Education Foundation (ACFEF). For the individual who is looking to work in the hospitality industry, our program is a comprehensive, practical, hands-on experience for volume food preparation. We immerse the future professional in many aspects of the commercial food industry. Students will be taught through hands-on experiences in setting-up banquets and food preparation, including hors d’oeuvres, smoking meats, charcuterie, along with baking and pastry basics. We are a comprehensive, fast-paced classroom where all competencies help to prepare the serious individual for entry level employment in various commercial food service establishments. Our students learn the critical importance of sanitation through attaining their ServSafe Food Safety Manager Certification, as well as through nutrition basics and restaurant management within the courses. This program is accredited by the American Culinary Federation Education Foundation (ACFEF). Fruit, Vegetable & Salad Prep. Meat, Poultry & Seafood Prep. Upon completion of the program and meeting eligibility requirements, including the attainment of an aligned industry credential, students may be awarded credits toward an AS/AAS Degree by Broward College or select schools in the Florida College System. Students must enroll in Broward College within 2 years of completing the program at Atlantic Technical College. Additional college credit may be awarded with the attainment of additional industry credentials. To get started in Professional Culinary Arts & Hospitality, sign up today for a program orientation. Click here to view our latest Food Inspection Report. Click here to view our latest Sanitation Certification. 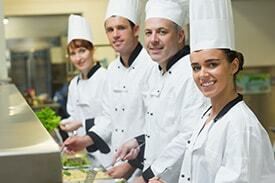 Demand for entry level chefs are expected to grow about 14%* between 2014 and 2024. Entry level wages are about $11/hour**. Actual wages vary according to education, experience and certifications.